Huhtanen Capital is a high-growth property investment company operating in the property market. Finding housing solutions is at the heart of our operations. Our revenue comes from rental income and the other operating income from property sales and revaluations. The company does not have a separate management company or charge management fees. Our costs can be found in our annually published group financial statement. We recognise our housing investments at their fair value on the balance sheet and aim to test the estimated valuation by selling apartments in apartment blocks we own. We take an entrepreneur-centred approach. Huhtanen Capital offers the scale benefits and property expertise of a large investor to its shareholders. In cooperation with other property investors, the company invests its assets in housing that offers strong cash flow and high yields. In accordance with its investment strategy, the company’s property-specific yield target is over 10 %. The company sells apartments from its property portfolio to other housing investors and consumers. Often, the company buys its investments directly from cities, municipalities and other housing investors. They are then turned into limited liability housing companies. Some or all of the purchased apartments are sold or rented. The company has registered an auxiliary business name, Huhtakodit Oy, which is used for all its rental business operations and tenant communication. We also produce digital services, which enable cost-efficient processes and management and improve our selling and marketing operations. We utilise existing cloud services as much as possible, and they allow us to keep development costs and risks in check. 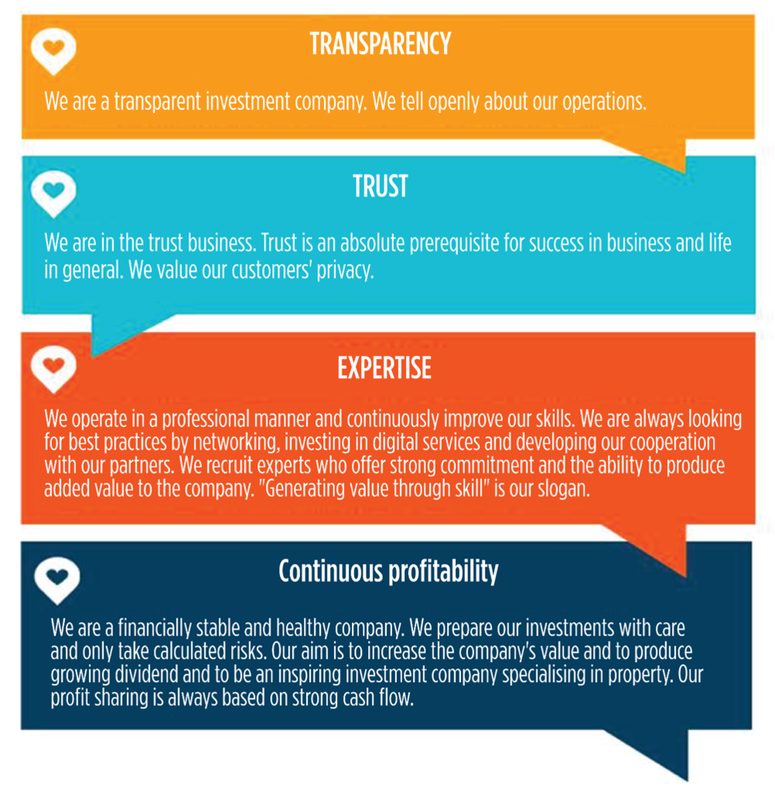 Our values are at the core of our business.